For those looking to bring an Old-World European look to their home, either to match the motif or accentuate a modernized look, Italian tumbled stone tile flooring is a fantastic option. In our previous blog, we went into detail about our Mexican tumbled stone; while similar, these two materials do not function the same at all. If you’re interested in classical charm, read on for more information about Italian tumbled stone flooring or wall tiles. Beyond simple floor tiles, Italian tumbled stone makes fantastic and brilliant shower walls, soap dishes, kitchen backsplashes, and more! These tiles have a proven track record that extends hundreds of years back for wall and flooring tile, lending an obvious hint to its durability and affordability. Many San Fernando residents choose to use these tiles in bathrooms, either in sequestered areas or adorning entire floors and walls. 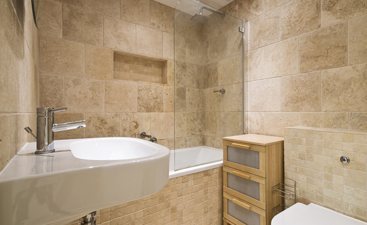 We especially recommend them for bathroom and shower flooring for their textured, natural slip-resistant surface. When we say old-world or classical, it may conjure up different imagery for individual readers. 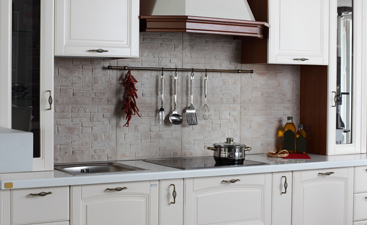 Italian tumbled stone tiles provide a textured, rich look that may feature natural blemishes; these blemishes come in the form of surface cracks, dents, or even small holes. 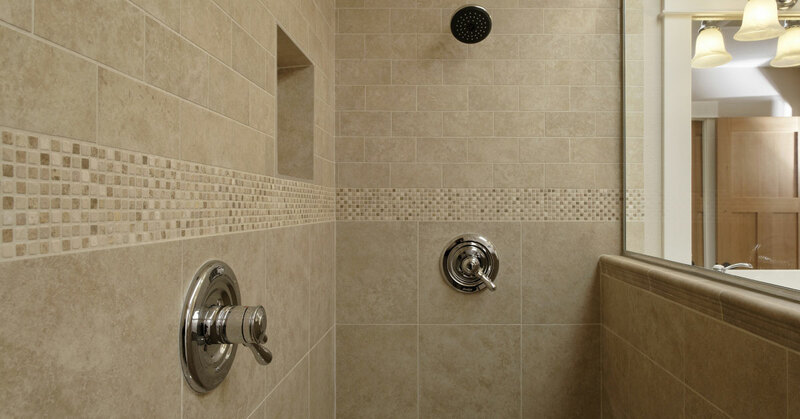 All of these provide different colors and textures to the tile, often with different colors and hues showing under the surface layer of the stone. What is created is a rich, multicolored surface that looks deeper than it is. While this sounds complicated, the look is one we’ve seen in classic European architecture, farmhouses, and maybe even in your grandparent’s kitchen. Italian tumbled stone is available in numerous colors and materials, which can be mix-and-matched to make a complete design, either with themselves at various sizes or with multiple colors. Perhaps the best attribute of these charming tiles is their ability to bring powerful colors without overwhelming the room. It isn’t often that you find a misty blue or bright yellow tile that can work in just about any room, but that is exactly what you’ll find with these relatively tapered tiles. Thanks in large part to the natural blemishes and coloration, these tiles can pull off a wide array of looks and emotions, all depending on how you choose to use them. Get in touch with the floor tiles experts at Transworld Tile today for help with your San Fernando or Thousand Oaks home. We have the skills and experience necessary to help you choose the best possible floor tiles for your home’s color and style. 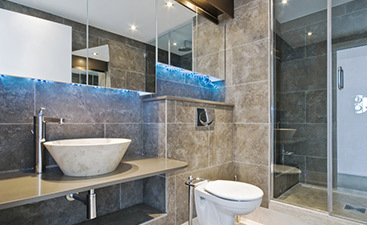 Visit our expansive showroom or check out picture samples of our floor tiles online! Contact us today to learn more or set up a time to meet with a flooring specialist!